TULSA, Okla. (October 16, 2018) – Tulsa Zoo will transform into a wonderland of candy and costumes for its 29th annual HallowZOOeen on Oct. 27-31. This Tulsa tradition provides a spooky, but not-too-scary, family friendly trick-or-treating option. This fundraising event to benefit zoo operations runs for five nights, so you can start trick-or-treating early or make the zoo your Halloween evening destination. Bats and ballerinas can enjoy HallowZOOeen from 6 to 9 p.m. on Oct. 29, 30 and 31, with last tickets sold at 8:30 p.m. To allow more time for candy and costumes, the Tulsa Zoo will open one hour early on Saturday and Sunday, Oct. 27 and 28, at 5 p.m.
On Tuesday, Oct. 30, wee royalty and budding buccaneers can have a fairy-tale feast during Pirates & Princesses. This swashbuckling adventure starts at 5 p.m. and includes an interactive character dinner, admission to HallowZOOeen and Haunted Train tickets. Tickets are $25 per dinner seat or $250 per reserved table of 8. Tickets are required for all guests, including children of all ages. For tickets and information visit tulsazoo.org/feast. HallowZOOeen 2018 will showcase treasured treats such as Burger King Royal Castle, QuikTrip Pirate Island and Paycor Pumpkin Patch Playroom. Burger King Royal Castle summons all princesses (and prince charming types) for royal court activities like coloring, kid-safe archery and a catwalk. Perhaps a sailor’s life suits ye more? Then chart yer course for QuikTrip Pirate Island for a swashbuckling adventure with the QuikTrip pirates. Every buoy and ghoul will enjoy the one-of-a-kind pirate ship, where seaworthy sprouts can take the helm. Kids of all ages will have a gourd time inside the Paycor Pumpkin Patch Playroom with a hay maze, pumpkin decorating and carnival games. Be warned, brave souls, that a tour through the Haunted House can be a hair-raising experience. Of course, the Tulsa Zoo hasn’t forgotten about the candy. Corporate-sponsored Goblin Stops line the zoo to provide a safe trick-or-treating environment where your kiddos can fill up goodie bags – and with more than 3 tons of candy, expect plenty of treats. Help the Tulsa Zoo green Halloween by reducing waste and bringing your own trick-or-treat bag from home. Buy tickets in advance to skip the lines. Tickets can be purchased online at tulsazoo.org/boo or at the Tulsa Zoo during regular business hours, daily from 9 a.m. to 5 p.m. Cost for admission is $9 for ages 1 and older; $8 for Tulsa Zoo members. The Haunted Train is back with spooky (but not-too-scary) surprises around every turn for only $5. Children can take a spin on the Scary-Go-Round for only $1. 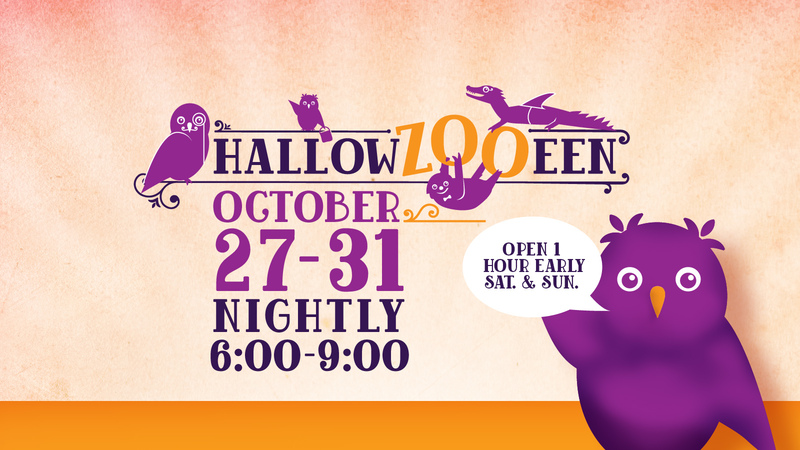 In addition to providing a safe trick-or-treating option, HallowZOOeen is an important fundraiser to help build a bigger, better zoo. HallowZOOeen 2018 would not be possible without our sponsors — major sponsor: Pepsi Beverages Company; Royal Castle sponsor: Burger King; Pirate Island sponsor: QuikTrip; Pumpkin Patch Playroom sponsor: Paycor; Contributing sponsors: First Oklahoma Federal Credit Union, IHOP, and Sky Zone; along with Goblin Stop sponsors: Andy B’s Tulsa, BP US Pipeline & Logistics, Gathering Place, Helmerich & Payne, Inc., OU Physicians, and Tulsa Drillers and Tulsa Roughnecks FC.